Do I know the way - or does the dog know better? 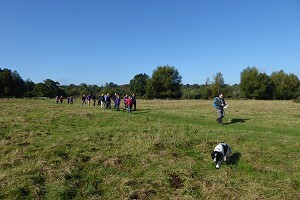 We had twenty people (plus a dog) for our walk on the first Sunday of October, including several newcomers and a few who'd come back for their second or third walk with us. That's always encouraging, but before I start blethering on about how popular our group must be, I should give credit to the weather. Saturday's weather had been wet and windy but today we had a crisp blue autumn sky with no wind and plenty of sunshine. Maybe that is what attracted everyone today. 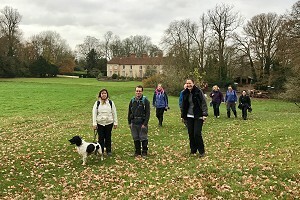 We set off from the village hall car park in Pangbourne, making our way past the Co-op and down a narrow lane that opened out into fields by the River Pang. Turning away from the Pang, crossing some fields and a quiet lane, we headed for Sulham Wood and our first bit of ascent. 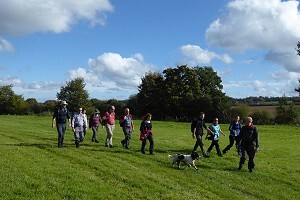 Crossing a field between Sulham Wood and Tidmarsh. 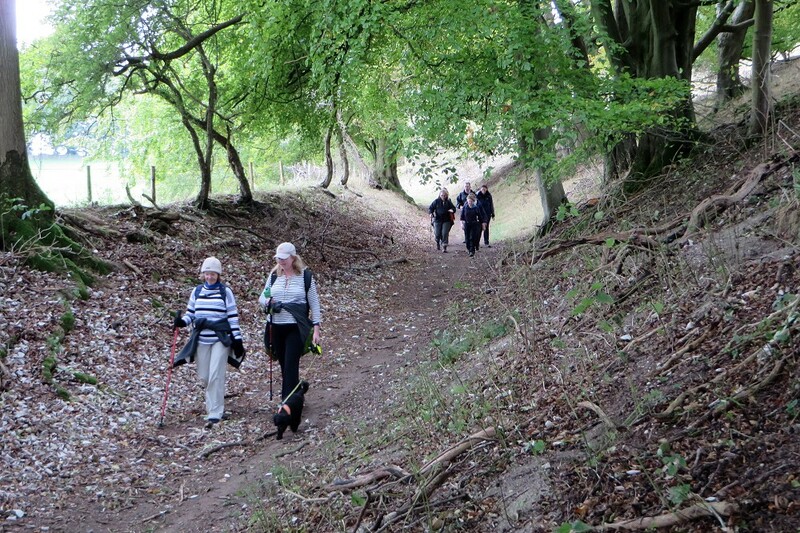 The path up into the wood was very steep (1 in 4) but steps had been provided and we stopped for a little rest at the top before taking the level path, north-east to Mosshall Wood. Following the curved edge of the wood, we then headed south across open fields and more woodland before turning sharply north-west and heading back into Sulham Wood. We found a good spot to stop for lunch, where there were many fallen trees to use for seating. After lunch we headed out of the woods and westward into Tidmarsh, where we stopped off for a drink at The Greyhound. It was warm enough to sit outside - provided you got a seat in the sun. Luckily only one table was in the shade. Stopping for a drink at The Greyhound in Tidmarsh. Fully refreshed we continued on our way, crossing the A340 to Pangbourne. We were only about a mile by road to Pangbourne, but that route would have been boring and too quick. So we went the picturesque way, around the edges of fields and through tree-lines footpaths and lanes that led us to Pangbourne College (an independent day and boarding school). Crossing through the college, we then followed a quiet road before taking a footpath through fields and woodland, emerging onto the B329 Shooters Hill. We followed this busy road back into Pangbourne, walking along the pavement which is also part of the Thames Path at this point. See our route on Bing Maps. Thank you to Julia for providing the photographs for this write-up. 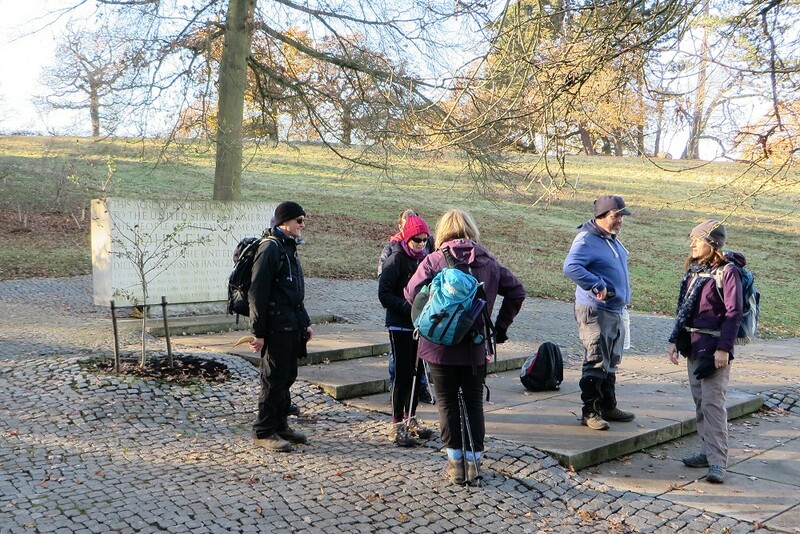 We've been trying to put a few more figure-of-eight walks in our programme as they effectively provide two different length walks for the price of one. Those wanting a shorter walk can leave after the first loop and those wanting a longer walk can stay for both loops. 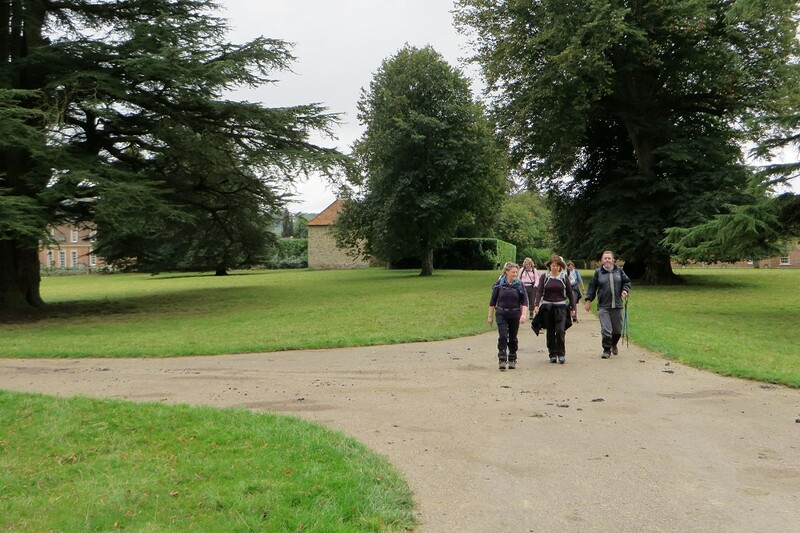 Today's walk consisted of an eight-mile loop around Watership Down and Sydmonton followed by a four-mile loop around Cottington's Hill and Hannington. We had nine people and a dog turn up on Saturday 8th October at the car park on White Hill. 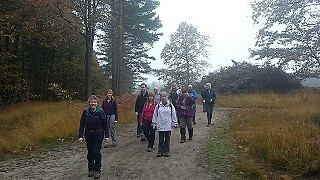 The weather didn't look as promising as it had for our walk the previous weekend. It was dull and a fine drizzle of rain had started just before we set off. Descending into Barton Copse on a tree-lined footpath. 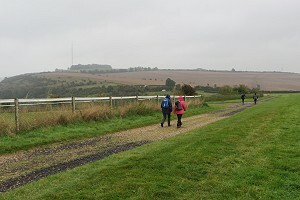 We joined the Wayfarer's Walk heading west as it passes between the gallops on Cannon Heath Down and above Watership Down. 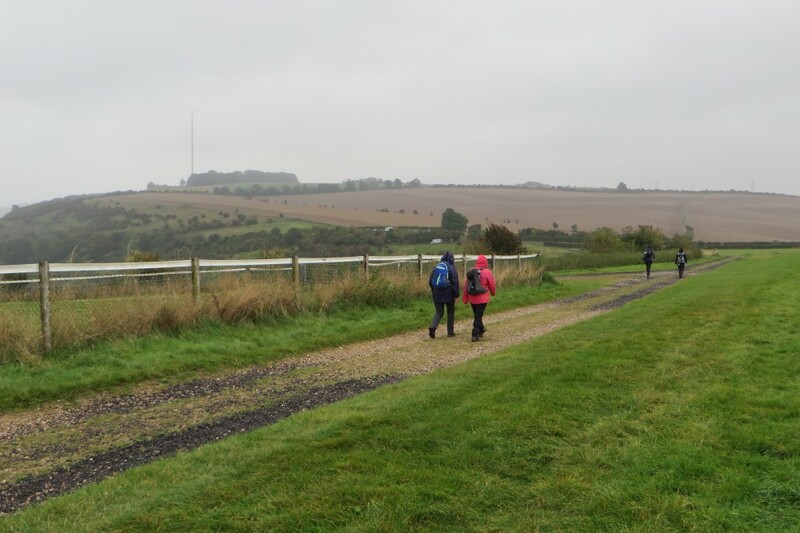 By the time we reached the end of the gallops, the drizzle had gone and we stopped to admire the view at what would be the highest point of our walk. We could see Sydmonton below us but views of Newbury were not so clear today due to the low cloud. We followed the Wayfarer's Walk through Nuthanger Down before leaving it to take a tree-covered footpath downhill to Barton Copse. The path flattened out and we emerged on a quiet road. Just a short way along we entered a tree-lined avenue through the estate of Sydmonton Court. Walking through the well-maintained estate of Sydmonton Court. Passing through this well-maintained estate, we then took a sharp left turn onto a track past Wergs Farm. A tractor looked almost like a toy as it slowly made its way through a massive ploughed field nearby. Behind the field were a group of trees in various stages of turning orangey-brown. Autumn is here. Leaving the track at Wergs Cottages we followed a road southward before joining a wooded footpath going in the same direction that took us back up onto the ridgeway. On our way up we occasionally got views of Beacon Hill to our west, and views of Watership Down and the transmitting mast atop Cottington's Hill to our east. At the top of the hill, the path opened out and passed through fields of stubble before joining the Wayfarer's Walk. Returning to the White Hill car park along the Wayfarer's Walk. It was almost sunny when we stopped for our picnic lunch, but we looked with suspicion at the dark grey sky to the north-west of us. Wetting my finger and holding it in the air, I optimistically declared that it would probably pass us by... probably. Finishing our picnic, we followed the Wayfarer's Walk up to Ladle Hill, by which time it had got rather cold and windy so layers were going back on. 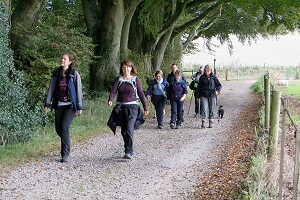 Soon joining up with our outgoing route, we followed the Wayfarer's Walk back to the car park. See our route on Bing Maps. During this time a light drizzle became persistent rain as the wind picked up. As we reached the car park an executive decision was made to abandon the second loop of the walk. Probably a good idea as the rain got much heavier on my journey home. On Saturday 15th October, twelve of us (including three guests from other groups) plus a dog called Wellington turned up for a walk that the leader, Mike had graded moderate+. It seems he thought the word challenging might discourage people who would be perfectly capable of doing the walk. 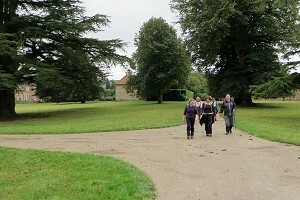 As it was, the walk contained a mixture of level walking and some hills, but nothing that gave any of us any difficulty. We started from Great Bedwyn and followed the Kennet and Avon Canal towpath north-east to Little Bedwyn. 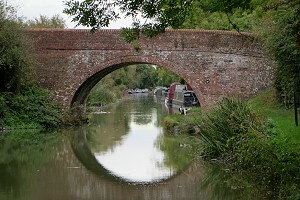 Here we crossed a double bridge over the canal and the railway line into the charming hamlet of Little Bedwyn. We left it via a field and then crossed the railway again, this time at a pedestrian crossing and then the canal again at a road bridge. 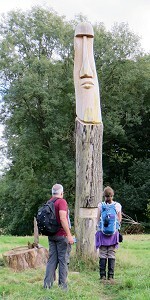 Bizarre Easter Island styled head, carved from a tree. Our first bit of uphill took us past Jugg's Wood and into Stype Wood, where we followed the Long Walk, a clear path through the wood, leading to Stype Grange. Not stopping for tea at what turned out not to be Mike's country house, we continued through Bagshot and Eastcourt Farm before reaching the village of Shalbourne. Here we stopped for our picnic lunch on the green outside The Plough pub. A couple of the group went in for a quick pint while we ate our sandwiches. 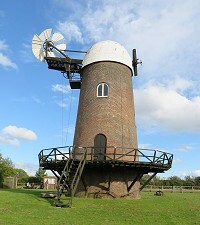 The windmill at Wilton, with the sails removed for winter. After lunch, we had another stretch of uphill, past Carvers Hill Farm and up to the A338, which we crossed into a field of maize, and the hiding place of numerous pheasants. Wellington, the dog, had to be kept on the lead as we passed through woodland and more fields, all occupied by pheasants. Eventually we were out of pheasant territory and making our way (uphill again) into Bedwyn Brail, a mixed woodland in which we found some interesting carvings made from the trunks of trees. One of these was of a great head, in the style of the ancient stone carvings found on Easter Island. 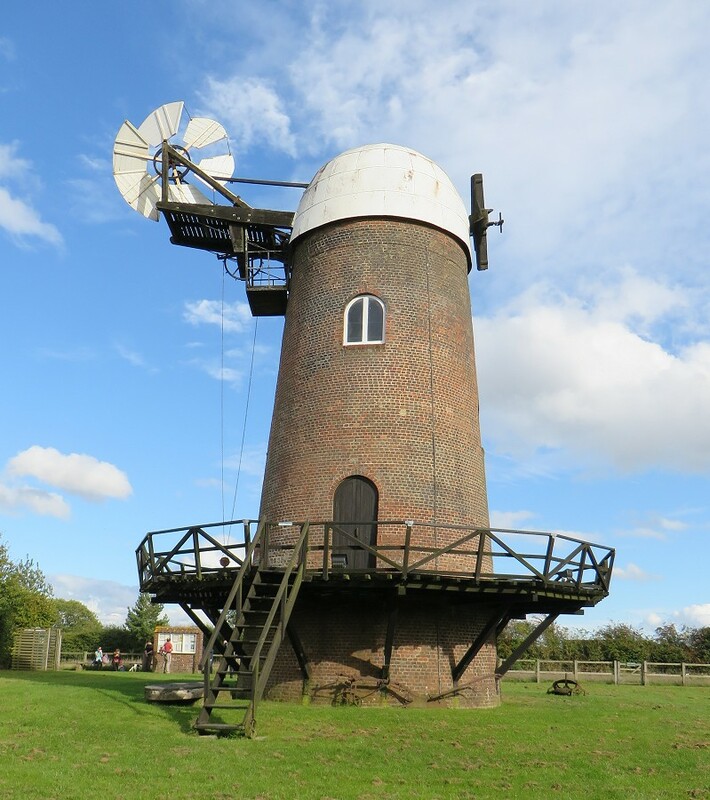 Next we stopped off to see the Wilton Windmill, a five-floor brick tower mill located on a chalk ridge near the village of Wilton. The sails had been taken off for winter but it still looked quite impressive. From there we walked into Wilton, where we stopped off at The Swan Inn for a drink. Wellington scouting ahead as we approach Mill Bridge, near Great Bedwyn. Suitably refreshed, we headed back to the Kennet and Avon Canal by the Crofton pumping station, which keeps the canal topped up at this, its highest point. The Crofton Beam Engines museum wasn't open so we didn't get to see the original pre-Victorian pumping station. We followed the canal towpath back to Great Bedwyn, passing several locks on the way. The weather was now on the turn, with the promised rain just starting to make its presence felt. As we approached Great Bedwyn, we diverted from the towpath to walk through the village and then back to the car park, just as the rain was getting going. See our route on Bing Maps. On the last Sunday in October, a group of sixteen people and one dog gathered for the walk, and we welcomed visitors from Loddon Valley Ramblers. We had a misty and somewhat overcast day, though remained dry and mild. We had, of course, enjoyed an extra hour in bed with the clock change! A dog on its way to a Halloween party! We passed the "Go Ape" obstacle course, children's playground and picnic area, which was busy. The Discovery Centre and cycle hire is also on offer to visitors. Here at the central hub we had a short refreshment break and opportunity to use the cafe and WC facilities. Leaving the centre, we took the Forest Walk with its evergreens and rhododendrons, heading for the Lower Star Post deeper into the forest. We managed to miss our turning but with help from our map and members of the group with GPS, found our way along the Roman road to the right point. From here we diverted off towards the Barossa nature trail. This led us close to the Army training area, where we came across a unit on a training exercise and were ushered around them. We think the rifles were using dummy bullets?! Walking through Swinley Forest on the day the clocks went back. A little further on we reached an open high promontory with misty views over Oldean Common. Following a steep downhill, we paused for lunch in a flat area now regenerated following the fire of 2011. Back on leafy tracks and trees showing their autumn colours we head up to Saddleback Hill (650m) and back into Surrey. Here the sandy path widened and was straddled by a series of huge electric pylons with views back down into the valley. At the crest of the hill we forked left through pine trees heading for the BT Relay Tower. We could barely see the top as it was covered in mist. 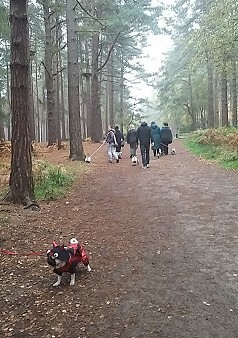 Unfortunately, we took our second wrong path - they all look the same in the forest!! Again, after a short backtrack we joined another track to link back to the woodland path and bridleway leading out the forest, past the upmarket Pennyhill Park Hotel Golf & Spa to rejoin Church Rd and back to the walk start. 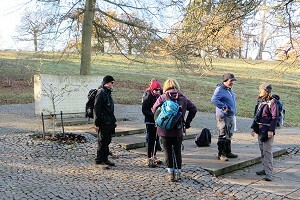 Our thanks go to Ian, Mike and visitor Colin who assisted with GPS positions, and the group who were very understanding with our navigational blips! Interestingly we did not go wrong on either of these points on the pre-walk!! Thank you to Kathy and Ann for leading the walk, for writing it up and for providing the photos. 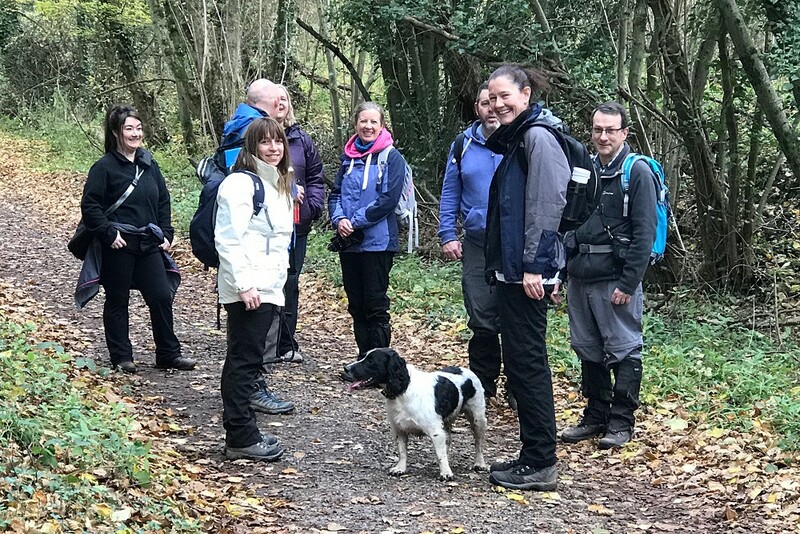 Given the rain and the wind we were pleasantly surprised that ten walkers turned up on Sunday 20th November for an eleven-and-a-half mile walk. Departing from the car park on the Henley Road we walked over the A404(M) bridge to join the butterfly trail and we made our way to Stubbing farm and Burchett's Green. Luck was with us as it stopped raining about twenty minutes into the walk. 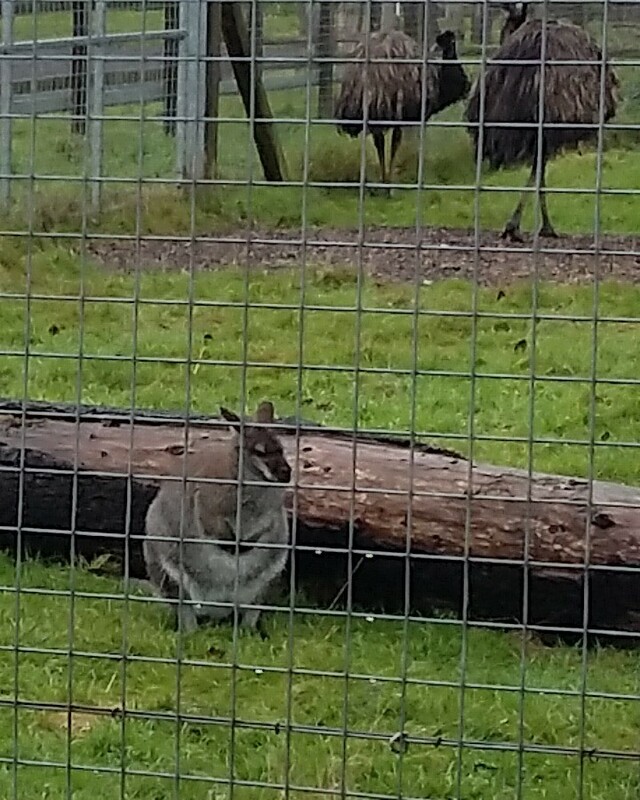 We took a footpath through the agricultural college and were able to see the wallabies and the Emus, as well as the red Squirrels, unfortunately the Scottish Wild Cat was nowhere in sight, but in the distance, we could see what we believed to be an a Al Paka. We made our way over farmland and emerged from high wood down the muddy steep slope from prospect hill to Hurley. We joined the Thames Path and walked towards Marlow crossing both Hurley and Temple Locks. We had our lunch stop in Higgins Park, and given the cold weather the cafe and toilets were very welcome. 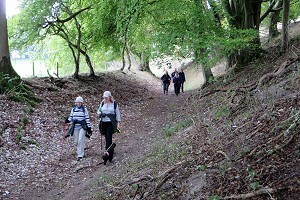 The next leg of the walk took us over the bridge to Quarry Wood and over two roads on our way up winter hill. Walking through a small wood on the way to Coppice farm one of the leaders realised that she had dropped her gloves and headed back to retrieve them. Somehow, she managed to emerge from the woods ahead of the rest of the group right near the turkey farm, needless to say the gloves were not found. 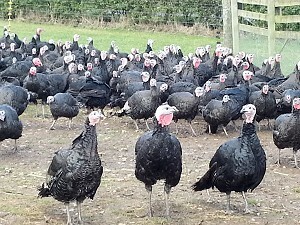 The turkeys were particularly quiet today, perhaps due to the weather or just maybe they knew how near it was getting to Christmas!!!! 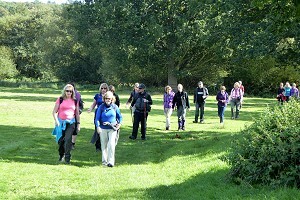 Leaving the farm, we headed towards and through Cookham common, 'no celebrity sighted today', as happened on a past walk. Bearing right onto Bix lane we kept Maidenhead thicket on our right, under the motorway to Robin Hood Arbour, with one more muddy path to walk before crossing back over the A404(M) to the car park where we started. 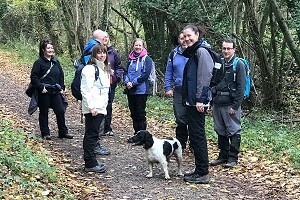 Nine walkers and a dog turned up on Sunday 27th November for a walk that I'd put on the programme at the last minute to fill a gap. 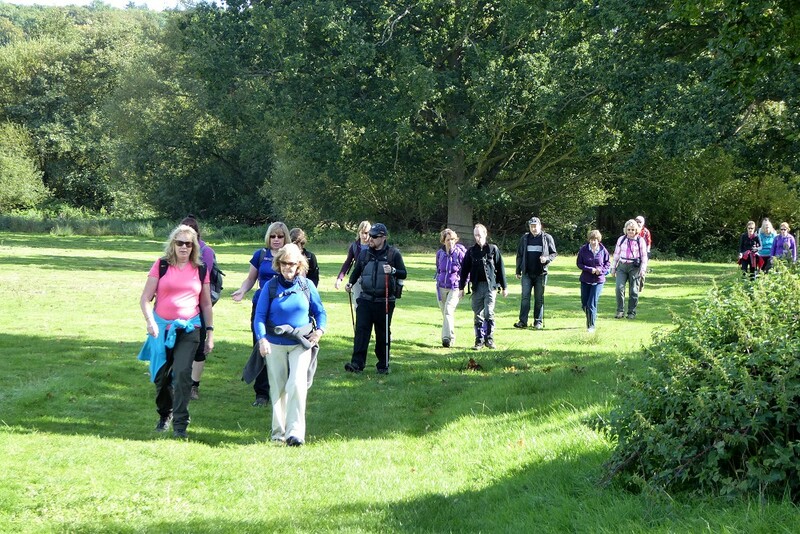 This was a walk I had led before in May 2013 as a joint walk with the Berkshire Walkers 20s & 30s group. From the car park at Hook station, we walked through the village, passing a couple of pubs, a few shops and a war memorial before getting out into the countryside at Owen's Farm. Turning south near Newnham, we crossed over the railway on a road bridge and passed through a small patch of woodland to emerge by the Basingstoke Country Hotel on the A30. Greywell Hill. There's a canal tunnel somewhere underneath us. Crossing the A30 and continuing south, we followed Heather Row down to a bridge over the M3 motorway, which we crossed into Gregory's Copse. Following a track through the woods, we came out at Eastrop Bridge over the Basingstoke Canal. This stretch of the canal was left as a nature reserve when the rest of the canal was restored in the 1980s. Crossing the canal bridge we were soon heading east, following the approximate course of the Greywell Tunnel, through woodland and fields. This tunnel, the longest on the Basingstoke Canal at 1.1km, was closed in 1932 when part of it collapsed. It is now a nature reserve and home to many different species of bat. We joined the canal towpath at the other end of the tunnel and followed this to King John's Castle, also known as Odiham Castle. We explored the 13th century ruins before stopping for our picnic lunch on some convenient benches. I attempted to take a 360° panoramic photograph from the middle of the castle. One of our group decided she wanted to appear twice in the photo and ran around as I panned the camera! A panoramic picture of King John's Castle (aka Odiham Castle). Spot the comedian who appears twice! After lunch, we continued a short way along the canal until we reached a swing-bridge. Leaving the canal, we followed the road down to a ford over the River Whitewater. Crossing the ford on a foot bridge, we skirted Warnborough Green and followed the course of the Whitewater for a short way, leaving it after crossing under the A287. After stopping off for a drink in the nice warm Derby Inn pub, we walked through Bartley Heath, crossing the M3 on a foot bridge, and emerging back in Hook. It was a short walk back to the station car park. See our route on Google Maps. Walking along the Long Walk outside Windsor Castle. 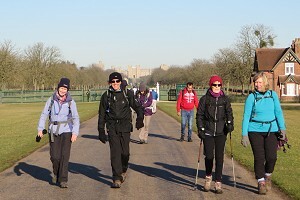 On Sunday 4th December, eight of us (including one newcomer) turned up in sunny Windsor for an eleven-mile walk. This was the day after our Christmas party and I reckon some of us woke up slightly worse for wear and didn't make it to the walk. I was in two minds about going when I woke up but I soon felt better once I got out there in the fresh air and sunshine. Walking along the Long Walk approaching the Copper Horse. This was a repeat of a walk that Greg had led for us a couple of years ago, and it started from the car park at the railway end of Alma Road. 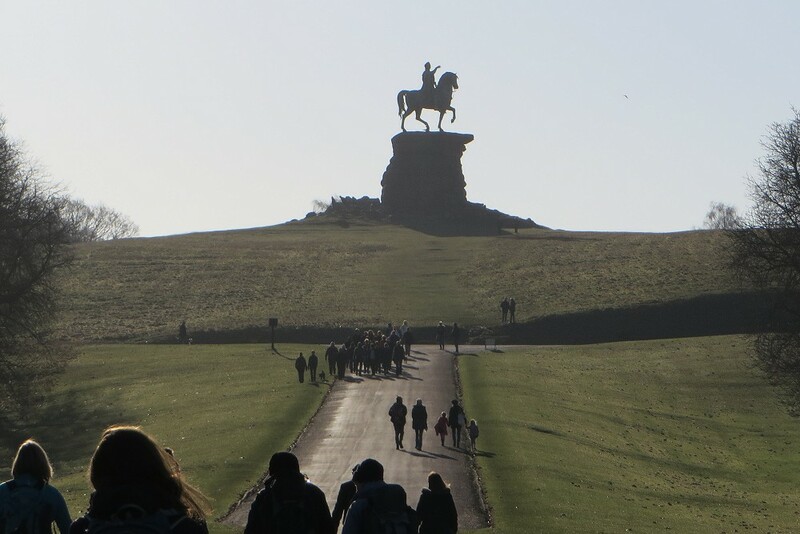 We skirted past Alexandra Gardens and made our way to Windsor Castle, where we joined The Long Walk, which we followed all the way to the Copper Horse (a statue of George III on horseback) on Snow Hill. Stopping to look at the John F Kennedy memorial. Last time we did this walk, we were passed by Her Majesty the Queen, driving a car along The Long Walk. No such brush with royalty this time. Turning left at the statue, we headed out of Windsor Great Park via Bishopsgate and headed east towards Runnymede. On our way, we stopped of to look at the John F Kennedy memorial, which was jointly dedicated by Queen Elizabeth II and Jacqueline Kennedy in May 1965. 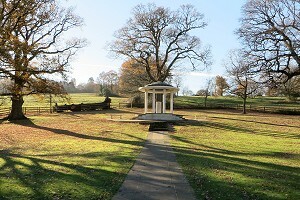 The Magna Carta Monument at Runnymede. 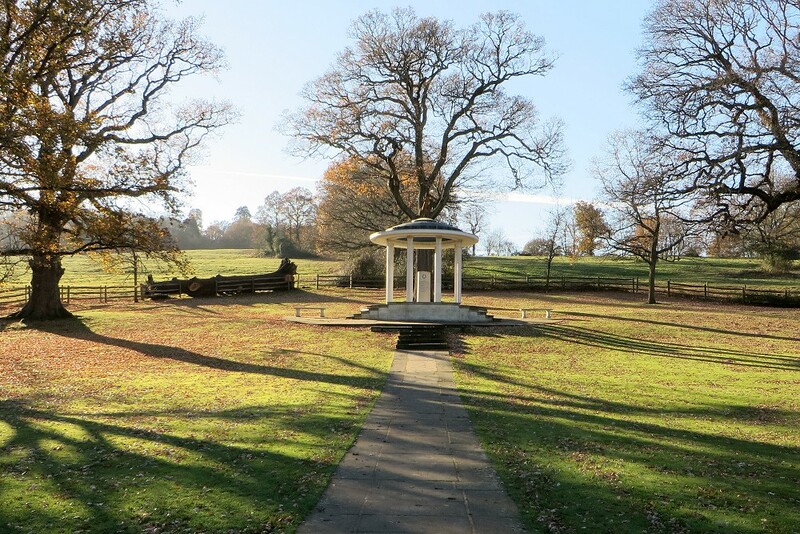 Following the 50 long steps down to Runnymede itself, some of us wandered over to look at the Magna Carta Monument while others examined the Juror's Chairs. 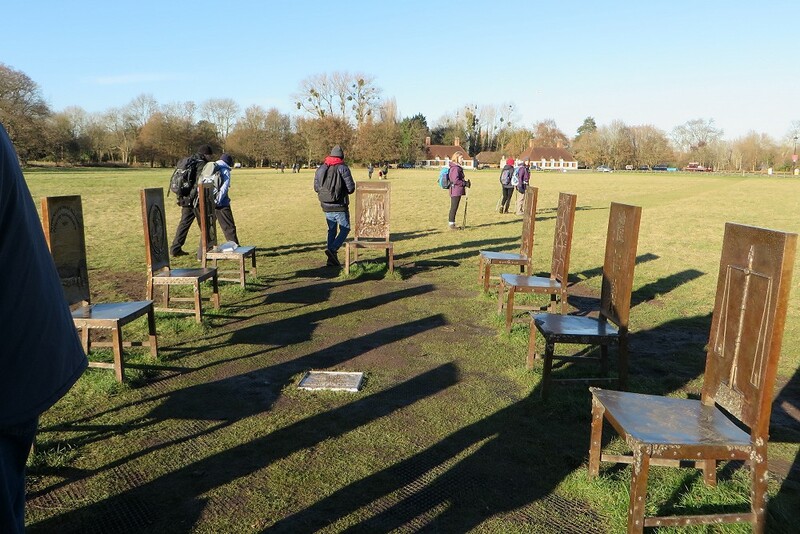 An art installation of twelve bronze chairs commissioned last year to commemorate the 800th anniversary of the sealing of the Magna Carta. 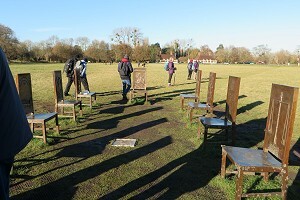 Juror's Chairs, commemorating the impact of the Magna Carta. Making our way down to the Thames Path we headed north-west, past the Runnymede Boathouse and stopped to eat our packed lunches at some convenient benches by the Thames. 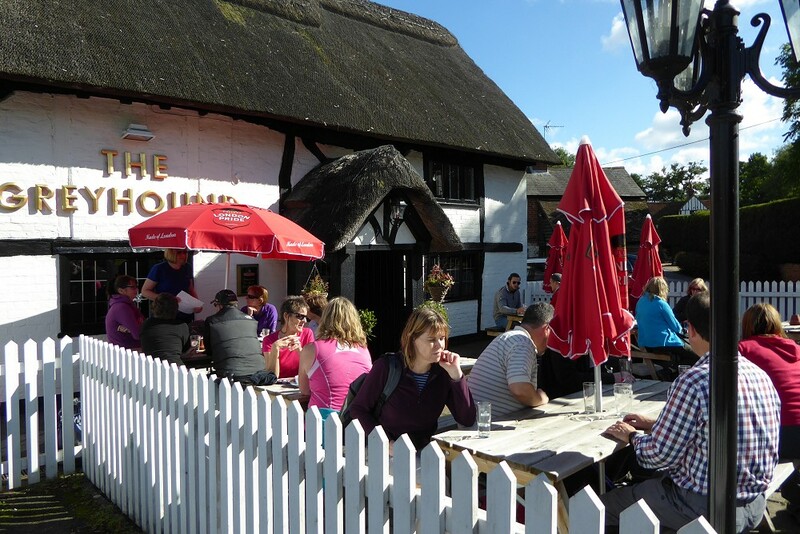 After lunch, we popped in to the Bells of Ouzeley for a warming drink before continuing the walk. The remainder of the walk followed the Thames Path for several miles back to Windsor. The path swaps from one side of the river to the other at various bridges, and leaves the riverside altogether to pass through Datchet. 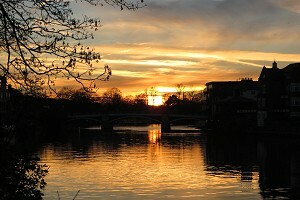 The sun setting over Eton Bridge as we returned to Windsor. Good views of Eton College and Windsor Castle were seen as we crossed The Home Park. Passing Romney Lock, the Thames Path led us back into Windsor as the sun was setting. It was about 4 O'clock and the fun fair on Alexandra Park was heaving with activity. 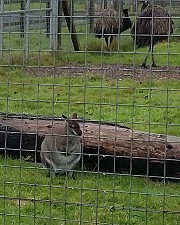 Our newcomer said goodbye to us to wander round and look for a present for his son. A few of us couldn't resist the temptation to have a go on the dodgem cars. It was great fun! After our little diversion, we were soon back at the car park where we'd started. See our route on Google Maps.